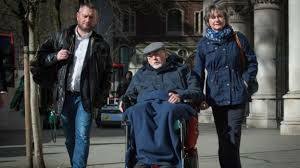 Mr Noel Conway is 67 years old and suffers from Motor Neurone Disease (MND) which he described as "a relentless and merciless process of progressive deterioration." When the time is appropriate, he wishes to have assistance to end his life but assisting suicide is a criminal offence in England and Wales - (Suicide Act 1961 section 2). In the High Court he argued that section 2 of the Suicide Act is incompatible with Article 8 of the European Convention on Human Rights and he asked the court to make a declaration of incompatibility as permitted by section 4 of the Human Rights Act 1998. The court held that section 2 is compatible with the Article 8 rights of Mr Conway and declined to make the declaration. The Queen (Noel Douglas Conway) v Secretary of State for Justice and others  EWHC 2447 (Admin) - Sales LJ, Whipple and Garnham JJ. The judgment is also available in pdf format via the Judiciary website.